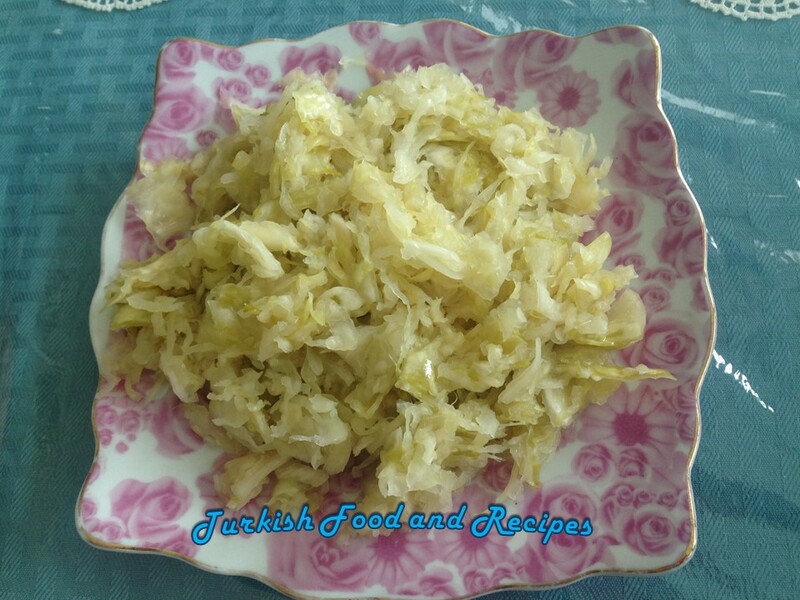 Take out the outer leaves of cabbage and wash. Shred the cabbage thin in a food processor or with the knife. Place the shredded cabbage in a large bowl, sprinkle salt and mix them. Apply pressure with a back of a wooden spoon and smash the shredded cabbage until the cabbage starts leaving its juice out. You may also let the salted cabbage rest for a couple of hours to let the juices out. Then, fill the glass/plastic containers with cabbage tightly making sure the cabbage is all covered with its own juice. The secret here is to suffocate the cabbage in its juice. 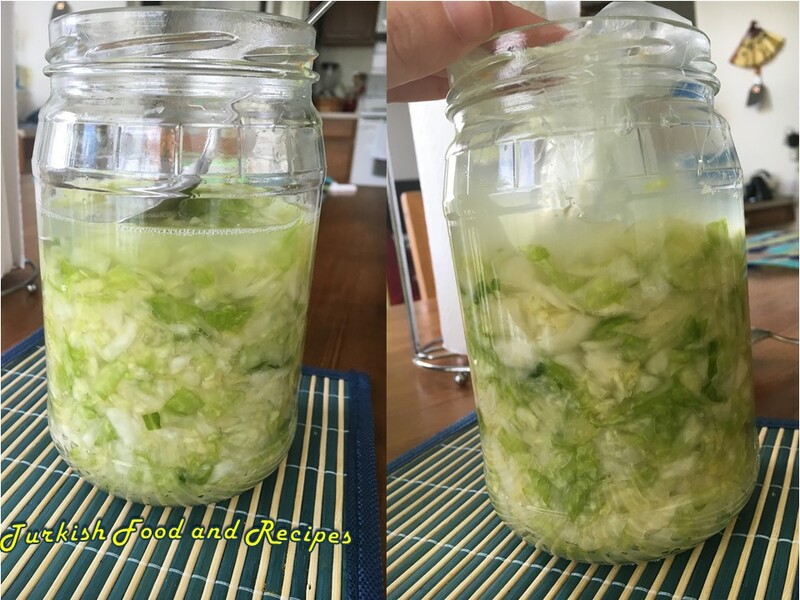 So, you need to cut out the air (oxygen) from the cabbage for a good fermentation process. Press from the top to fill as much as cabbage you can. Put a clean weight on top to suffocate the cabbage. I filled a clean plastic bag with water and used it as a weight on top. You may cover the top with a cheese cloth or any other clean cloth to avoid contamination. Do not cover the top with lid. Store it in a dark and cool place. If the place is cold, the fermentation will take place in 2-3 weeks. If it is warm/room temperature, then it will be ready to eat in 10-15 days. Once it gets ready to eat keep it in the refrigerator. Lahananin dis yapraklarini atin ve yikayin. Mutfak robotunda veya bicak ile ince ince kiyin. Kiyilmis lahanayi genis bir kaseye alin, tuzu ekleyin ve karistirin. Tahta kasigin tersi ile bastirarak lahanalara basinc uygulayin. Zamanla lahana suyunu birakacaktir. Arzuya gore lahanayi bir kac saat dinlenmeye alip, suyunu birakmasini bekleyebilirsiniz. Sonra, lahanayi kavanoz ya da bidonlara bastirarak sikica doldurun. Guzel bir fermentasyon icin, puf noktasi lahanayi kendi suyuyla kaplayip, lahanayin hava ile temasini kesmektir. Kavanozlar doldurun ve kasikla uzerinden bastirarak, uzerinin tamamen su ile kaplanmasini saglayin. Uzerine temiz bir agirlik koyun. Ben, agirlik olarak temiz bir posetin icine biraz su koydum ve lahana ile dolu kavanozlarin uzerine koydum. Kavanozlarin uzerine temiz bir bez ortebilirsiniz. Kavanozlara kapak kapatmadan, serin ve karanlik bir ortamda fermente olmaya birakin. Ortam eger soguk ise, fermentasyon 2-3 hafta, eger ilik ya da oda sicakligindaysa, 10-15 gun surecektir. Ondan sonra lahana tursunuz tuketime hazir olacaktir. Buzdolabinda saklayabilirsiniz. Thank you for the great recipe. It's very nice and tasty. Keep sharing such an amazing post. Thank you for forming an article that has great substance and is exquisitely made and even I am enlivened by your composed style as well. This has been proposed for the instrumentality for the general population for the paper composing administration surveys from best essay writing service in this reported and formally perceived means for the general population.